1. A registration program for pharmacy technicians is established for the purpose of establishing technician competency and for the purposes of identification, tracking, and disciplinary action for the violation of federal drug laws or regulations, state drug or pharmacy laws, or board rules. The ultimate responsibility for the actions of a pharmacy technician working under a licensed pharmacist’s supervision shall remain with the licensed pharmacist. 2. A person who is or desires to be a pharmacy technician in this state shall apply to the board for registration. The application shall be submitted on a form prescribed by the board. A pharmacy technician must be registered pursuant to rules adopted by the board. Except as provided in subsection 3, beginning July 1, 2010, all applicants for a new pharmacy technician registration or for a pharmacy technician renewal shall provide proof of current certification by a national technician certification authority approved by the board. Notwithstanding section 272C.2, subsection 1, a pharmacy technician registration shall not require continuing education for renewal. a. Beginning July 1, 2009, a person who is in the process of acquiring national certification as a pharmacy technician and who is in training to become a pharmacy technician shall register with the board as a pharmacy technician. The registration shall be issued for a period not to exceed one year and shall not be renewable. b. A person who is registered as a pharmacy technician or a pharmacy technician trainee prior to January 1, 2010, who has worked as a pharmacy technician or pharmacy technician trainee for a minimum of two thousand hours in the previous eighteen months under the direction of a licensed pharmacist shall have until December 31, 2013, to attain certification pursuant to this section. The supervising pharmacist shall be responsible for verifying with the Iowa board of pharmacy that any person affected by this paragraph continues to have a minimum of two thousand hours of supervised training in any eighteen-month period of time between January 1, 2010, and December 31, 2013. 4. The board shall adopt rules in accordance with chapter 17A on matters pertaining to pharmacy technician registration, application, forms, renewals, fees, termination of registration, tech-check-tech programs, national certification, training, and any other relevant matters. 5. The board may deny, suspend, or revoke the registration of, or otherwise discipline, a registered pharmacy technician for any violation of the laws of this state, another state, or the United States relating to prescription drugs, controlled substances, or nonprescription drugs, or for any violation of this chapter or chapter 124, 124A, 124B, 126, 147, 205, or 272C, or any rule of the board. A registration program for pharmacy technicians isestablished for the purposes of determining the competency of a pharmacy technician or of an applicant for registration as a certified pharmacy technician, pharmacy technician trainee, or uncertified pharmacy technician and for the purposes of identification, tracking, and disciplinary action for violations of federal or state pharmacy or drug laws or regulations. 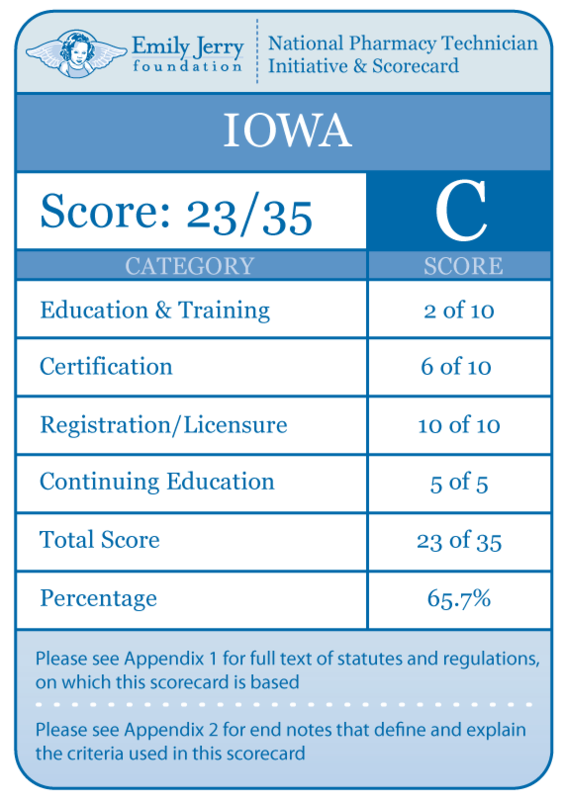 Any person employed in Iowa as a pharmacy technician, except a pharmacist-intern whose pharmacist-intern registration is in good standing with the board, shall obtain and maintain during such employment a current registration as a certified pharmacy technician, pharmacy technician trainee, or uncertified pharmacy technician pursuant to these rules. An individual accepting employment as a pharmacy technician in Iowa who fails to register as a certified pharmacy Ch 3, p.2 Pharmacy IAC 10/5/11 technician, technician trainee, or uncertified technician as provided by these rules may be subject to disciplinary sanctions. A certified pharmacy technician accepting employment as a certified pharmacy technician in Iowa who fails to register as a certified pharmacy technician or who fails to maintain national certification may be subject to disciplinary sanctions. 3.3(1) Licensed health care provider. Except as provided in this rule, a licensed health care provider whose registration or license is in good standing with and not subject to current disciplinary sanctions or practice restrictions imposed by the licensee’s professional licensing board and who assists in the technical functions of the practice of pharmacy shall be required to register as a certified pharmacy technician, technician trainee, or uncertified technician pursuant to these rules. Any person not currently registered with the board as a pharmacy technician shall complete the appropriate application for registration within 30 days of accepting employment in an Iowa pharmacy as a pharmacy technician. Such application shall be received in the board office before the expiration of this 30-day period. A person who is enrolled in a college-based or American Society of Health-System Pharmacists (ASHP)-accredited technician training program shall obtain a pharmacy technician trainee registration prior to beginning on-site practical experience. A person who is employed in a pharmacy and who is receiving pharmacy technician training through work experience shall obtain a pharmacy technician trainee registration within 30 days of the commencement of pharmacy technician training. Each pharmacy technician registered with the board will be assigned a unique registration number. 657—3.5(155A) Certification of pharmacy technicians. Except as provided in rule 657—3.6(155A) or subrule 3.5(3), effective July 1, 2010, all pharmacy technicians shall be required to be nationally certified as provided by this rule. National certification does not replace the need for licensed pharmacist control over the performance of delegated functions, nor does national certification exempt the pharmacy technician from registration pursuant to these rules. A certified pharmacy technician shall maintain the technician’s national certification, in addition to the technician’s Iowa registration, during any period of employment in an Iowa pharmacy as a certified pharmacy technician. 3.5(1) Certification prior to July 1, 2010. An individual who holds a valid current national certification from the Institute for the Certification of Pharmacy Technicians (ICPT) or the Pharmacy Technician Certification Board (PTCB) and who acquired such certification prior to July 1, 2010, shall be deemed to have met the requirement for national certification beginning July 1, 2010, provided the certification is maintained in current standing. 3.5(2) Required certification effective July 1, 2010. Beginning July 1, 2010, national certification acquired through successful completion of any NCCA-accredited pharmacy technician certification program and examination fulfills the requirement for national certification. 3.5(3) Pharmacy technician trainee. Except as provided in rule 657—3.6(155A), effective July 1, 2009, a person who is in the process of acquiring national certification as a pharmacy technician shall register with the board as a pharmacy technician trainee. The registration shall be issued for a period of one year and shall not be renewed. 3.5(4) Certified pharmacy technician. Beginning July 1, 2010, all applicants for a new pharmacy technician registration except as provided by subrule 3.5(3), and all applicants for renewal of a pharmacy technician registration except as provided in rule 657—3.6(155A), shall provide proof of current national pharmacy technician certification and shall complete the application for certified pharmacy technician registration. e. Any other information deemed necessary by the board and as provided by this rule. 3.8(2) Declaration of current impairment or limitations. The applicant shall declare any current use of drugs, alcohol, or other chemical substances that in any way impairs or limits the applicant’s ability to perform the duties of a pharmacy technician with reasonable skill and safety. 3.8(3) History of felony or misdemeanor crimes. The applicant shall declare any history of being charged, convicted, found guilty of, or entering a plea of guilty or no contest to a felony or misdemeanor crime (other than minor traffic violations with fines under $100). 3.8(4) History of disciplinary actions. The applicant shall declare any history of disciplinary actions or practice restrictions imposed by a state health care professional or technician licensure or registration authority. 3.8(5) Additional information. The following additional information shall be required from an applicant for the specified registration. a. Technician trainee. The applicant for technician trainee registration shall identify the source of technician training, the anticipated date of completion of training, and the anticipated date of national certification. b. Certified pharmacy technician. The applicant for certified technician registration shall provide proof of current pharmacy technician certification. The applicant shall also identify all current pharmacy employers including pharmacy name, license number, address, and average hours worked per week. c. Licensed health care provider. In addition to the additional information required by paragraph “a,” “b” or “d” as applicable, a licensed health care provider shall provide evidence that the licensee’s professional license or registration is current and in good standing and is not subject to current disciplinary sanctions or practice restrictions imposed by the licensee’s professional licensing authority. d. Uncertified pharmacy technician. The applicant for uncertified pharmacy technician registration shall submit with the application for registration renewal one or more affidavits signed by the pharmacists in charge of one or more Iowa pharmacies where the applicant practiced as a pharmacy Ch 3, p.4 Pharmacy IAC 10/5/11 technician during the 18 months prior to submission of the application for registration. Affidavits shall be on a form provided by the board office. 3.8(6) Sworn signature. The applicant shall sign the application under penalty of perjury and shall submit the application to the board with the appropriate fees pursuant to rule 657—3.10(155A). 657—3.9(155A) Registration term and renewal. A pharmacy technician registration shall expire as provided in this rule for the specified registration. The board shall not require continuing education for renewal of a pharmacy technician registration. 3.9(1) Certified pharmacy technician registration. A certified pharmacy technician registration shall expire on the second last day of the birth month following initial registration, with the exception that a new certified pharmacy technician registration issued within the two months immediately preceding the applicant’s birth month shall expire on the third last day of the birth month following initial registration. 3.9(2) Pharmacy technician trainee registration. 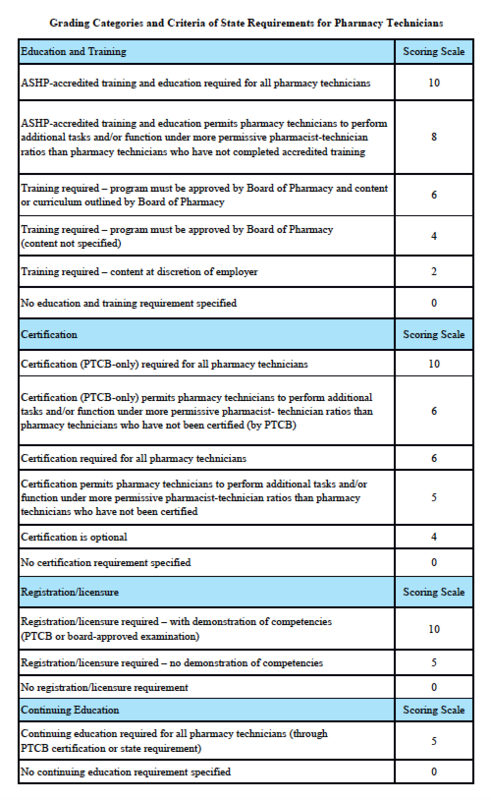 Beginning July 1, 2009, a registration for a pharmacy technician who is in the process of acquiring national certification (technician trainee) shall expire on the last day of the registration month 12 months following the date of registration or 12 months following the date registration was required pursuant to subrule 3.3(3). a. National certification completed. When the registered technician trainee completes national certification, and no later than the date of expiration of the technician trainee registration, the pharmacy technician trainee shall complete and submit an application for certified pharmacy technician registration. A successful application shall result in issuance of a new certified pharmacy technician registration as provided in subrule 3.9(1). b. Voluntary cancellation of registration. A registered technician trainee who fails to complete national certification prior to expiration of the technician trainee registration shall notify the board that the pharmacy technician trainee registration should be canceled and that the individual has ceased practice as a pharmacy technician. c. Failure to notify the board. If a pharmacy technician trainee fails to notify the board prior to the expiration date of the technician trainee registration regarding the individual’s intentions as provided in paragraph “a” or “b,” the technician trainee registration shall be canceled and the individual shall cease practice as a pharmacy technician. 3.9(3) Uncertified pharmacy technician registration. Beginning June 1, 2010, a registration for a pharmacy technician who qualifies for the time extension for certification as provided by rule 657—3.6(155A) shall expire the second last day of the birth month following the latest scheduled registration renewal. In no case shall a registration for an uncertified pharmacy technician expire later than December 31, 2013, unless the pharmacy technician attains national certification as provided in subrule 3.5(2) and is reclassified as a certified pharmacy technician. At the discretion of the supervising pharmacist, the following technical functions, in addition to any of the functions authorized for a pharmacy support person pursuant to 657—Chapter 5, may be delegated to a pharmacy technician as specified in the following subrules. a. Perform packaging, manipulative, or repetitive tasks relating to the processing of a prescription or medication order in a licensed pharmacy. b. Accept prescription refill authorizations communicated to a pharmacy by a prescriber or by the prescriber’s office. c. Contact prescribers to obtain prescription refill authorizations. d. Process pertinent patient information, including information regarding allergies and disease state. e. Enter prescription and patient information into the pharmacy computer system. f. Inspect drug supplies provided and controlled by an Iowa-licensed pharmacy but located or maintained outside the pharmacy department, including but not limited to drug supplies maintained in an ambulance or other emergency medical service vehicle, a long-term care facility, a hospital patient care unit, or a hospice facility. g. Affix required prescription labels upon any container of drugs sold or dispensed pursuant to the prescription of an authorized prescriber. h. Prepackage or label multidose and single-dose packages of drugs, including dose picks for unit dose cart or AMDS fills for hospital or long-term care facility patients. i. Perform drug compounding processes for nonsterile compounding as provided in 657—Chapter 20.
j. Perform drug compounding processes for sterile compounding as provided in 657—Chapter 13.
k. As provided in rule 657—3.24(155A), accept new prescription drug orders or medication orders communicated to the pharmacy by a prescriber or by the prescriber’s agent. f. Affix required prescription labels upon any container of drugs sold or dispensed pursuant to the prescription of an authorized prescriber. g. Prepackage or label multidose and single-dose packages of drugs, including dose picks for unit dose cart or AMDS fills for hospital or long-term care facility patients. h. Under the supervision of a pharmacist who provides training and evaluates and monitors trainee competence in the compounding processes, perform drug compounding processes for nonsterile compounding as provided in 657—Chapter 20.
i. Under the supervision of a pharmacist who provides training and evaluates and monitors trainees, and contingent on successful completion of appropriate media fill testing processes, perform drug compounding processes for sterile compounding as provided in 657—Chapter 13.